I live over on Diamond and Nassau, where apparently a woman was raped the other day. I’ve never felt unsafe in my neighborhood, but after this and the recent muggings on Driggs in the same area, I just wanted to get the word out for my neighbors to stay safe and alert. Thanks for all you do with newyorkshitty, and congrats on being named best neighborhood blog! Thanks for bringing this to my attention, Casey. I want to tender my sincerest wishes to the victim of this assault and her loved ones. 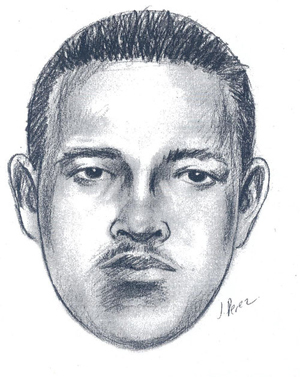 I suppose it goes without saying that if anyone reading this knows anything about this crime (which came to pass Tuesday, October 20, at 4:30 a.m. and whose suspect’s composite sketch graces this post) please contact Crimestoppers via telephone, text message or online at: 1-800-577-TIPS (8477), CRIMES (274637) (then enter TIP577) or www.NYPDCrimeStoppers.com. All tips/calls will remain confidential. Be careful out there, folks and ladies please be advised that if you are out at these wee hours and need a safe ride home do not hesitate to contact Rightrides. They serve Williamsburg and Greenpoint and it’s absolutely FREE.